The song being featured this evening is titled "Pride and Joy"(2). 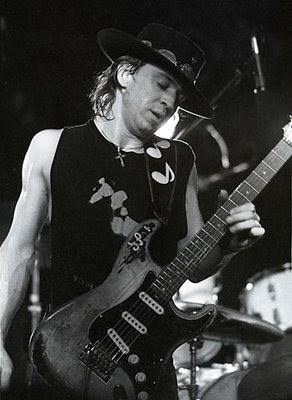 It was written, recorded and sung by a brilliant Texan, Stevie Ray Vaughan. "Pride and Joy" first shows up in Stevie's first single released in 1982. It is also the 2nd track on his debut albumn titled "Texas Flood" which subsequently was released in June 1983. Vaughan and the four others on board - pilot Jeff Brown, agent Bobby Brooks, bodyguard Nigel Browne, and tour manager Colin Smythe - were all killed. Most fans in the area were unaware of the initial impact, but according to a catering director at the resort, she remembered hearing a boom and felt her trailer shake. The helicopter was identified as being owned by Chicago-based company Omniflight Helicopters. Initial reports of the crash falsely claimed that Clapton had also been killed in the accident. The video was published on Feb 12, 2013 by StevieRayVaughanVevo is an electric blues rock and roll genre. Now that was a mouthful. I love this man's music and highly recommend his albumn.